How did immersion get dragged into these relationships? I'm not dragging it in by iteslf. I came up with the snappy acronym and catch phrase “AIR-based relationships” to define the area of my inquiry. 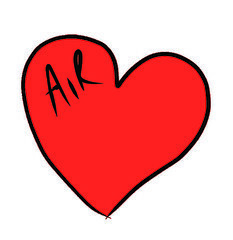 AIR = Anonymous identity + Immersive environment + Romantic attraction. It seem to me that the combination of these three factors creates an especially unstable and volatile mix. When not 'immersed' you wouldn't have the relationship either, is that what you are saying, or does immersion create these relationships...? Well, it seems to me that if you weren't immersed, you'd be more conscious of the fact that the hot babe you were flirting with could quite possibly be someone who looks like your grandfather in real life. Humans exposed to attractive images of their preferred gender(s) can experience reflex physiological responses that flood the brain and body with hormones that act like a love drug. I've written about this process in the past. If everyone walked around in a Naruto avatar, I reckon there would be far fewer romances. Well, I would say that if you are focused on a text chat enough to get romantically attached to someone, the text chat environment is immersive for you, and your online affair would be an AIR-based relationship. At least until you traded real IDs and/or met in person. Well, at least forelle saw it. :) What I tried to convey in the last paragraph was that the person you are in a relationship with is a complex living being with vast potential for growth and change. So if your love requires that they don't externally express significant inner changes, then it is a love of an objectification of your lover's past state, not of who they are now. From my limited experience, it seems there is generally less slack for change in AIR-based relationships. Well, I'm out of juice for now. If any of my ideas still seem cryptic, please let me know and I'll give it another go. "From my limited experience, it seems there is generally less slack for change in AIR-based relationships." That would be my starting hypothesis (or at least initial hunch) too. The AIR (I like that acronym, both because it is clever and because the spelled-out version is usefully descriptive) environment seems more conducive to objectification (my thinking in this regard is strongly influenced by feminist and other critical work on mass media and objectification). So, another interesting question might be -- under what circumstances do people move past objectification in the AIR context, and how might virtual environments be developed to enhance those circumstances? On the "immersion" issue (and BotGirl's nice quip about the hot avie whose typist looks like your grandpa -- *shudder*), I think there is some useful insight to be gained from Georg Simmel's explorations of reciprocal knowledge and secrets as constitutive elements of social relationships. I love the new terminology of "AIR-based relationship". Like any piece of truly helpful jargon, it is catchy precisely because it is loaded with meaning, expressing complex chains of ideas in a single phrase. I believe that this will quickly enter into the SL collective consciousness and be brought to widespread use. I do have a question about one of your observations. Referring to the the qualifiers for an AIR-based relationship, you state: "It seems to me that the combination of these three factors creates an especially unstable and volatile mix." While I don't necessarily disagree, I wonder if you are also suggesting that non-immersive relationships (those where RL is transparently shared) are somehow more stable and less fraught with peril? If indeed that is what you are saying, I don't think I can agree. Except in the comparatively rare occasions where two single, seeking people connect in RL through meeting in SL, it seems to me that crossing the RL line more frequently ends in disaster. I know so many people who have endangered their RL marriages and families because they let a SL relationship cross over. Now whether people in committed RL relationships should be seeking SL romance in the first place is beside the point. The point is that as long as things stay AIR-based, at least the inevitable damage is constrained to the virtual realm. Cross the line, and the carnage becomes real. "AIR = Anonymous identity + Immersive environment + Romantic attraction"
"Well, it seems to me that if you weren't immersed, you'd be more conscious of the fact that the hot babe you were flirting with could quite possibly be someone who looks like your grandfather in real life." Now, obviously there is a big flaw here, as these relationships persist through periods of non-immersion as well, the moments you could go through what you described as 'flirting with your grandfather'. So its not the immersion that breaks it at all. Furthermore, the three elements might sound poetic and make a neat little word, but they don't mix all that well in the context you are using them, Immersion being the odd one out once again, because from what I know of romance - if you like how the person makes you feel (lets just simplify 'romance' to be that for the moment) how does the 'think it looks like your grandpa' matter? I mean, if the relationship is based on the visual aspect rather than the social one, its really not that romantic at all is it. And last time i checked 'flirting' with a pretty picture wasn't exactly called 'immersing' either. Thank you for the 'ping' in the other comments by the way ;) Ashamed to say I found your post again through my technorati feed for 'immersion' but you are bookmarked now! forelle: I like your question about looking into how some people manage to move past the objectification. I'll check out the Georg Simmel reference. night: It's hard to write without either falling into generalizations on the one hand, or softening the ideas so much that they lose meaning. So I agree that there are RL relationships that are volatile and SL relationships that are stable. That said, I think the factors I've mentioned here and over the course of a number of posts point of factors that make AIR relationships challenging outside of all the other stuff that is common to any romantic relationship. digado: First, everything in my comment to night is relevant to your comment. Outside of that, if I'm hearing you right, you are saying there is are no signfificant psychological factors related to an immersive experience that impacts relationships? Is that an accurate reflection of your thinking? "...I'm hearing you right, you are saying there is are no signfificant psychological factors related to an immersive experience that impacts relationships"
Not compared to those that have nothing to do with immersion, no. I mean, what exactly is the suspension of disbelief in these relations? The character, the match of visuals and character, the situation, the (social) environment, your own ability/self awareness? Are you immersed into a romantic affair with a virtual being or just interacting as humans through avatars, both well aware you are sharing a social experience? I don't see where the immersion kicks in as a relevant factor for love/relationships/romance versus the more common basic social interaction of humans in any condition, just outed in virtuality rather than physical reality, and the contradictions in the 'AIR' theory doesn't really work out unless you can explain persistent relations through periods of non-immersion for starters. What I mean is that the psychological and biological response to AIR-based interactions I've described is not experienced by everyone. So if you haven't felt it yourself, it is not surprising that you are skeptical. I think a good analogy is an audience watching a horror film. Some members of the audience sit there with a smirk on their face. Others have varying degrees of physical and emotional reaction. A few may be so upset that they feel afraid long after the lights come up. I'm guessing this example won't sway your opinion, so maybe we can just disagree on this for the time being. In any case, I appreciate your thoughts and the time you've taken to add to the conversation here. digado: You wrote "was hoping you could provide some insights in how you think immersion affects these relationships "
So I don't think the problem is that I'm not trying to share insights, but that you don't agree with them. And since I don't know you very well outside of your blog posts snd comments here, I'm about out of idea of how to do any better within the context of this comment thread. It seems to me that if you see absolutely no impact of immersion on relationships, despite tons of research on the psychological impact of immersion on human thought and emotion, then I'm out of ideas on what else to offer, except maybe a bibliography. Anyway, my wagons may be circled, but you are invited to jump in. Have a good weekend. digado: I apologize for the less-than-respectful tone of my earlier responses to your comments. Upon reflection, I realized that the source of the frustration I ended up projecting at you was actually my own lack of clarity on this stuff. Please bear with me. I hope to have a more refined expression of what's behind the AIR idea soon. Then if we end up disagreeing, it will at least be about the same thing.